A true, fade-resistant, three-dimensional paper. Perfect for covering bulletin boards, play scenery, table skirting and decorating. 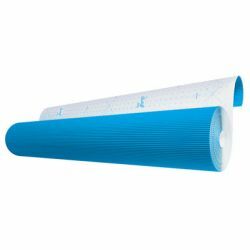 Corrugation on one side provides a firm surface for painting, gluing and other craft activities. Exclusive guideline design on the back makes it easy to cut, measure or score. 48" x 25'. Recyclable.